Adaptation to changing environmental conditions along the life cycle of arthropod transmitted parasites obviously requires signalling to regulate the host-parasite interaction. Due to important roles of cAMP in development of lower eukaryotes and the high conservation of the respective signalling pathway, the main effector of cAMP, protein kinase A (PKA) came into focus. 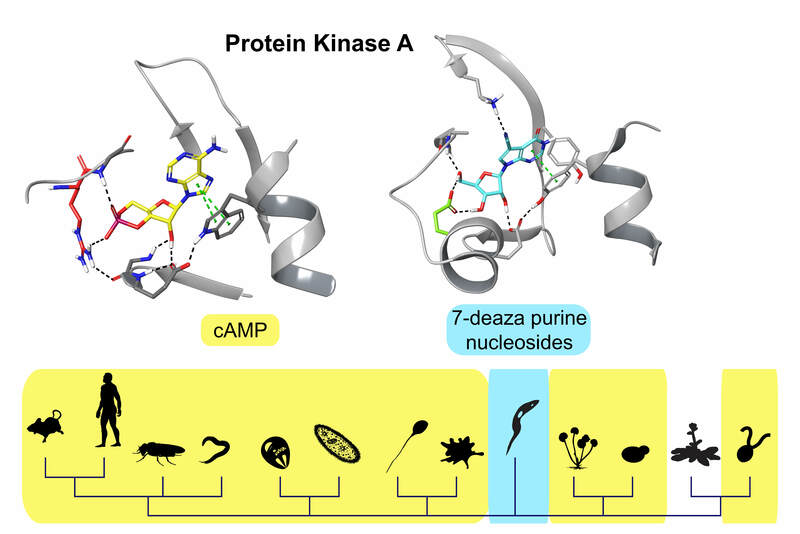 In this paper, we show that protein kinase A (PKA) of trypanosomatids is not regulated by cAMP but by nucleoside analogues. PKA is the main effector of cAMP in all eukaryotes investigated so far and a paradigm for the mechanisms of ligand-dependent and allosteric regulation in signalling. Not surprising, a large body of evidence was required to challenge the corollary that all PKA orthologues are cAMP-dependent or at least cyclic nucleotide-dependent protein kinases. The trypanosome model again serves as vanguard to explore novel biochemisty: the existence of eukaryotic cyclic nucleotide binding (CNB) domains with alternative binding specificity suggests that there might also be orphan CNB domains in other eukaryotes regulated by yet undiscovered signalling molecules. In addition, the highly potent, species-specific and membrane permeable nucleoside analogue activator that we developed is a powerful tool to explore cAMP-independent PKA signalling in medically important neglected pathogens. Our PKA-induced phosphoproteome identified numerous PKA targets that match the role of this kinase in cell division, motility and development of the parasite. Protein kinase A is a cAMP dependent kinase in all known eukaryotes except kinetoplastids. Only land plants have no genes encoding a PKA. The origin of this long lasting project dates back to the 90ies when my PhD students Thomas Klöckner and Cordula Baums cloned and sequenced the PKA subunit genes in the pre-genome era. All their attempts to link the gene products to cAMP-regulated kinase activity failed. With negative data in hand and some reports of cAMP-dependent kinase activity in the related kinetoplastids T. cruzi and Leishmania, we were obviously not in a position to publish the observation. Susanne Kramer then started functional analysis of that unusual PKA as her PhD project and developed an in vivo kinase reporter assay to exclude all the possible technical reasons for lack of response to cAMP. One drug (dipyridamole) she used to increase intracellular cAMP surprisingly induced kinase activity, in contrast to all other approaches. This left us with an enigma but triggered rethinking of the problem and consideration of known clinical side effects of the licensed drug dipyridamole. A link to nucleoside metabolism seemed possible. 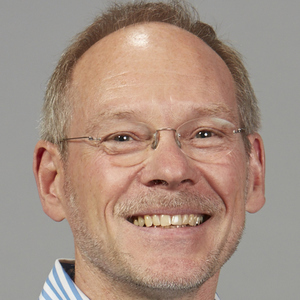 With essential ideas and input from Frank Schwede, chief chemist at Biolog Life Science Institute, Sabine Bachmaier, now postdoc and first author of the paper, developed a focused compound screen for PKA activators that led to discovery of the 7-deaza-nucleoside analogues. This work converged with major progress made by George Githure to express and purify the recombinant PKA holoenzyme and to structurally model the ligand binding sites. Right time to recruit a new PhD student, Yuri Volpato, previously trained in biophysics and crystallography: with a co-crystal structure and ITC binding assays he provided a detailed explanation of the ligand specificity swap from cAMP to nucleoside analogues. Needless to say that in order to wrap up the story we had wonderful help from collaborators who provided expertise and infrastructure for structural work, proteomics and phosphoproteomics. There is a grain of salt as in most success stories: it took more than one generation of students to break the ice and some would have liked to see a publication earlier, very understandably. But there is more to come and many open questions as well. The new activators will be used to explore cAMP-independent PKA signalling in kinetoplastids and possibly define a new pathway. A key question is the identity of endogenous ligands that serve as alternative second messengers in trypanosomes. How widespread is the alternative ligand specificity in related protozoans and when and why did this occur in evolution of PKA? Can the alternative ligand specificity be exploited pharmacologically? 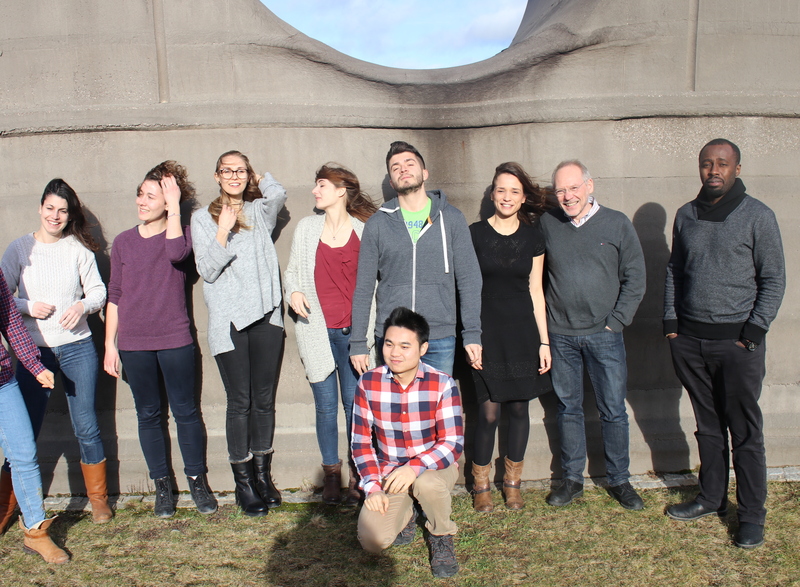 My research group at LMU is interested in signalling events regulating parasite development, metabolic adaptations and host-parasite interactions. Using Trypanosoma and Leishmania as models, we currently focus on novel cAMP pathways and cAMP-independent protein kinase A (PKA) signalling.